Natural Born Citizen - A Place to Ask Questions and Get the Right Answers: Trees are plants but not all plants are trees. "natural born Citizens (NBC)" are "Citizens at birth (CAB)" but not all "CAB" are "NBC"! Trees are plants but not all plants are trees. "natural born Citizens (NBC)" are "Citizens at birth (CAB)" but not all "CAB" are "NBC"! Of Trees and Plants and Basic Logic: Trees are plants but not all plants are trees. Likewise, "natural born Citizens" are "Citizens at Birth" but not all "Citizens at Birth" are "natural born Citizens"! While a natural born Citizen is obviously a Citizen at birth, not all Citizens at birth are natural born Citizens at birth. The two legal terms of art are not identical and are not equal. All "natural born Citizens" are Citizens at birth but not all Citizens at Birth are "natural born Citizens" at birth. If you cannot grasp that logic concept then try this analogy, "all trees are plants but not all plants are trees". Most citizens of the USA are natural born citizens. Natural born Citizens of the USA are the three leaf clovers of the types of Citizens, not four leaf clovers. By the vast majority, most citizens of the USA were born in the USA to two parents who were citizens of the USA. And that is the pool of citizens that must be chosen from for the singular most powerful office in our nation, the President and Commander-in-Chief of our military. Simple citizenship at birth by being born in the USA without regard to the citizenship status of both your parents ... or by naturalization and swearing an oath to this country and renouncing all allegiances foreign kings, princes, and potentates later as an adult, is adequate for the offices of Senator, Representative, or a Governor of a state. But it is not sufficient to be the President under Article II, to Constitutional standards. Article II requires that the person to be eligible to be President must be a "natural born Citizen". And that means that person must be born in the USA ... AND ... both his parents must be citizens of the USA. And "natural born Citizens" are not rare in the USA. The "natural born Citizens" are by far the most populous group in the nation. And it from this group, under Article II of our Constitution, we are to choose our President and Commander-in-Chief, the group with sole allegiance at birth to the USA and only the USA, not someone who has foreign and/or dual citizenship and divided loyalties at and by birth. And the reason for this is as important today as it was when the founders and framers added those additional words to the eligibility clause in Article II. And given the vast power of the military today, having a President and Commander in Chief of the military with sole allegiance at birth to only the USA is even more so. Obama's father was not a citizen of the USA, nor was he an immigrant to the USA, nor was he even a permanent resident of the USA. Obama when born in 1961 was a British Subject via his British Subject father, per the British Nationality Act of 1948 which governed the status of children born to British Subjects. Obama thus was born with dual citizenship and dual allegiances and a foreign claim on his allegiance. Obama is not a natural born citizen of the USA and he is not eligible to be the President under Article II of our U.S. Constitution. He is a Usurper. Of Trees and Plants and Basic Logic: Trees are plants but not all plants are trees. Likewise, "natural born Citizens" are "Citizens at Birth" but not all "Citizens at Birth" are "natural born Citizens"! Obama is NOT a "natural born Citizen" of the United States! Looks like a good method of presenting the concepts and it may even make a few of the Flying Monkeys learn a bit ... (naw; ignorance is correctable but stupid is forever)!!! "paralegalnm" has some pertinent observations as usual. It's hard to believe that so many people "misunbderstand" the concepts. Maybe the "forever" comment above applies? Obama supporters cite case law dicta declaring any native-born citizen to be a natural born citizen. Justice Clark in Schneider v. Rusk, 377 US 163, 177 (1964), dissenting; stated only a native-born may become President, Art. II, § 1. Tell that to John McCain. Perhaps this is merely a symptom of the worship of English law by the legal scions of Eastern Ivy League education that has packed our highest courts of law. Instead, look at the 1790 and 1795 Acts. In the first, a child was 'as a natural born citizen' if born overseas outside U.S. jurisdiction, as long as the father was a U.S. citizen. Sounds more like Vattel than English law. If the father was, for some reason, out of the equation, then the 1795 Act, Sec. 3, allowed for legislative exceptions and determinations (See 'The Case of Mr. Smith,' 22 May 1789). As Cmdr. Kerchner points out, the 14th Amendment (and thus 8 USC 1401) defines these exceptions; however, note that the only citizen at birth not requiring dealienage by naturalization law is the child of two U.S. citizen parents. Therefore, the 14th Amendment clause "under the jurisdiction thereof" denotes a child born without innate or inchoate FOREIGN allegiance from a birth parent. Thirty-years of misconception and liberalization of the 14th Amendment has created a society taking 'native-birth' for granted as being the winning ticket for the prize, not privilege, of U.S. citizenship. This is the false impression that allowed the son of a British subject, in fact a Muslim hater of the West, and a Marxist, to become President of the United States. This is directly contrary to the intentions of the framers, specifically in writing Art. II's 'natural born citizen' clause. The Obama presidency, the son of an foreigner/alien becoming president, sets dangerous precedent. Therefore, it MUST be addressed by the 112th Congress. Puzo1 said "The Obama presidency, the son of an foreigner/alien becoming president, sets dangerous precedent. Therefore, it MUST be addressed by the 112th Congress." Mario, I Agree. But from the letters I got back from my republican congressmen here in Georgia that will not happen. They see nothing, hear nothing, and say nothing! Only the sand they have their heads in can give them their just due. By never letting them pull their heads out to speak of their honor and oath ever again. In the US, are US citizens the only persons who do not owe allegiance to a foreign sovereignty? What is the status of citizenship and allegiance of a resident exile from another country who has yet to become a US naturalized citizen? Can it be argued that an exile, who has renounced his foreign citizenship and allegiance, no longer owes allegiance to a foreign sovereignty? And if so, would his child, born in the US, be a natural born citizen? I ask this question because of Marco Rubio. There is talk that he could run for President some day. Rubio was born in Florida to Cuban exile parents. If his parents were not yet naturalized by the time of Rubio's birth (and so far I have not been able to ascertain when they became US citizens) and they did not owe allegiance to Cuba, would Marco Rubio be a natural born citizen? I have been trying to get the RNC in DC to realize that Bobbie Jindal is not eligible to the presidency. Both of Jindal's parents were on student visas, technically 'non-immigrants' according to 8 USC 1101. Jindal, like Obama, was born a foriegn national. Rubio's parents, at least, were exiles from Cuba and, under U.S. law, lawful residents and under U.S. protection. A question you might look into is if the Rubio's qualified under the 'dry feet' doctrine, that upon reaching U.S. soil undetected, they were immediately granted U.S. residency, if not citizen status. Their intention to naturalize is an important distinction. However, under the laws of the time of the framers, the Rubios were required to fulfill a statutory residency requirement, apply for naturalization . . . and . . . when naturalized, Marco Rubio THEN would become a citizen derivatively . . . not merely by being born on U.S. soil. If the parents were naturalized prior to Marco's birth, Marco would be a natural born citizen. Michael Berry is a Houston-based conservative talk show host. Filling in for Mark Levin, he mentioned his wife was born in India, naturalized, and became a U.S. citizen and an attorney. 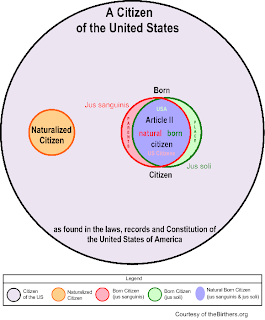 I e-mailed Berry, summarizing the question of Bobbie Jindal not being a natural born citizen . . . and asked if he could discuss the issue with his wife. If she agrees that a child, native-born, of an un-naturalized alien resident is not a natural born citizen, she might convince fellow Indian national at birth, Bobbie Jindal. I have tried to do this through the RNCHQ (I have Parrish Braden's e-mail address) but to no avail. One press release from Jindal concluding the child of a foreign national is not a natural born citizen could set the Obama presidency back on its heels, and open the question wider for the courts. Personally, I like a more current, topical analogy: all terrorists are Muslim, but not all Muslims are terrorists. Paralegalnm, thanks for the reply. I will check into that "dry feet" doctrine. Of course, if Rubio's parents naturalized before Rubio's birth, then Marco Rubio would be a natural born citizen. There is even a US Supreme Court case (Perkins v. Elg, 1939) to back that up. But the question still remains: If at the time of Rubio's birth, Rubio's parents did not owe allegiance to a foreign sovereignty, due to their having renounced their Cuban citizenship/allegiance upon becoming exiles in the US, and they were not yet US citizens, would Marco Rubio be a natural born citizen? Per jus sanguinis, parents transmit their citizenship to their children. But what if the parents are not citizens of any country, such as might have been the case with Rubio's parents? If they transmitted no citizenship to Marco Rubio, would the US citizenship he received per jus soli be sufficient to qualify as a natural born citizen? I am with you on Jindal. His parents were citizens of India at the time of his birth, and so Jindal is not a natural born citizen. If the father bore a child in a foreign nation, and the child maintained the natural born citizenship status of the fathers nation, then Obama certainly is and was a natural born citizen of Kenya/Subject of the Crown, no matter where he was born. Then came womens rights. But if women and men have the same right to pass citizenship to thier children, no child born to 2 people of separate nationalism's could be considered a "natural" born citizen, its a conflict to presume that one child holds natural born citizenship qualifications for...2 nations. Its not hard to see why Obama wants to evade facing the cold hard facts in a Court of Law. He still holds British Citizenship by right of inheritance from his father. 'OWING' is the key word. Although an exile from another sovereignty may not pay or wish to pay allegiance, the allegiance is still 'owed' until the debt is formally terminated, in the case of USA, such an exile must apply for citizenship, get accepted, swear an oath to USA relinquishing and denying any other allegiance & become naturalized, then their children born thereafter will be 'natural born Citizens' of USA.